BMW i Electrical Vehicles, Why us? Following the success of our specialities in BMW motor vehicles, we have extended our excellent facilities to cater for the electric range. At Grosvenor we love evolution and understand electric vehicles are going to be a huge part of our future. At Grosvenor we use full dealer diagnostic equipment and offer the same service and technical expertise as we do for all BMW marques. 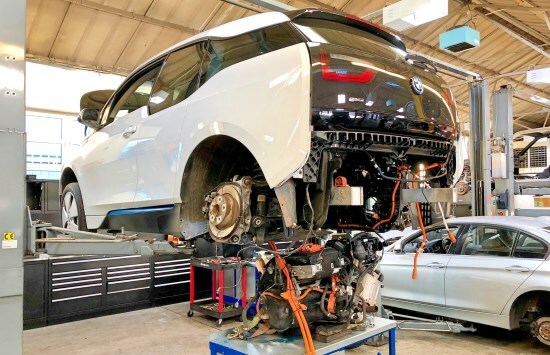 Our service team will be happy to assist all electric vehicle owners to get the absolute most from their pride and joy. From servicing, repairs, retrofits, software updates and coding, we have it covered. Main dealer diagnostic equipment used. All servicing is logged with BMW to update the digital service record (DSR). Independent BMW Specialist stamp used to stamp your service book. Your BMW warranty is maintained with any of our work. We can offer you various upgrade options for your electric vehicle. From basic servicing to coding, we have it covered.